The Northampton African Dance Community, in partnership with The Northampton Center for the Arts, is pleased to announce its second annual event, a Workshop Series with two master West African dancers. Khady Malal Badji from Senegal and Yalani Bangoura from Guinea will each teach a two-hour dance workshop on Saturday September 23rd. Both workshops will be accompanied by live drumming. Khady Malal Badji is the choreographer for the premier dance company, Bakalama, in Dakar, Senegal. She is a remarkably versatile artist who has taught intensive workshops across many dance genres, including African, jazz, modern, and hip hop dance; Capoeira; choreography, contact improvisation, theater and voice. She has performed at festivals in Senegal, such as the International Festival of Arts and Culture (FESNAC), and internationally, in such countries as Portugal, Spain, Sweden, Kuwait, and throughout the U.S. When she visited the U.S. last summer, teaching in San Francisco, Chicago, Northampton, and Brattleboro, she attracted crowds who were taken by her vibrant teaching and graceful movements. Yalani Bangoura is a master dancer, performer, choreographer, acrobat, and teacher of dances from Guinea in West Africa. He is also known for his exciting hip-hop dance. Yalani is currently a member of the award- winning West African Dance and Drum Company, Les Merveilles de Guinea. Yalani has toured with Les Merveilles since 1995 in the United States and Europe as well as in Mali, Guinea, Senegal, and the Ivory Coast. He moved to New York in 1998. He continues to perform with Les Merveilles as well as with Bamidele Dancers and Drummers, Sankofa, and Rhythmic Response. He serves as a master artist in residence with several of these dance companies. 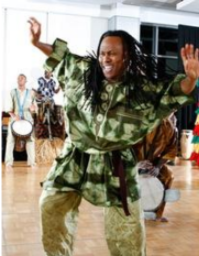 The Northampton African Dance Community is an intergenerational group of dancers committed to sharing the dance and drumming traditions of West Africa with the help of master artists. The Community holds a dance class every Thursday evening in the Karuna Center for Yoga at 25 Main Street (3rd floor) in Northampton and is pleased to showcase the talents and teaching of local as well as guest artists. This is the group’s second annual conference. The workshops take place on Saturday, September 23rd, in a newly renovated teaching space at the Arts Trust Building, 33 Hawley Street in Northampton (The workshop room is located downstairs, accessible directly by the lower level entrance). The first workshop, taught by Khady, will start at 1:00 P.M. and continue through 3:00 P.M. The second workshop, taught by Yalani, will start at 3:30 P.M. and continue through 5:30 P.M. There is abundant on site parking at the venue. Tickets are available online at a slight discount here – or at the door in cash. This program is supported in part by a grant from the Northampton Arts Council, a local agency which is supported by the Massachusetts Cultural Council, a state agency.